It has taken me longer than usual to sit down to write this review, because I don’t seem to know how to put in words what I feel about this book. 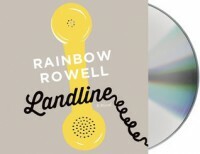 I would have to say that Rainbow Rowell does not cease to impress me. I have loved both her adult novels so far because they are very real. She has the kind of magic that can turn simple everyday things into a wonderful story highlighting the beauty that life is. You don’t have to go and live an adventure (although I love those too) to experience true joy and I feel like she captures this marvellously. This time around the main focus is marriage. I’m not a marriage lady, as you may know, but I do have meaningful relationships in my life, as assume all of you have, and all the lessons Georgie learns throughout the book are applicable to those as well. I have always felt that love is decision you make every day to stick by a person’s side. Of course it all starts with a fuzzy feeling, let’s say, in your heart, but true love is a decision. Georgie seems to learn this the hard way thanks to a magic telephone that allows her to realize all the mistakes she’d made in her relationship with her husband, which was mainly that she took him for granted. Her priority was work, and she was very good at it, but her decision was always work and never her husband. It was really a fun journey she goes through and I was a bit nervous along the way to see if she was able to make things right. I loved Neil. He is the perfect lovable husband any working woman would want. I have always been a sucker for good guys, and he is the ultimate good guy ever. He was very real too. With flaws and everything, but he clearly had his priorities in order which I very much appreciated. I did not care much for Georgie’s mum, because she kept telling her daughter his husband left her, which he hadn’t. I didn’t feel she was very supportive. The same could be said about Seth. He was clearly a great writing partner. He was funny and charming, but he didn’t want to let go of Georgie and he seemed to not know where his place was. They had some mixed priorities in y opinion. Overall, it was an excellent story that moved me. I loved the combinations of characters, and how the story was switching back and forward between their past and present. It really worked great. I also loved the touch of magic that was added through the phone. I’ve read some reviews that said they didn’t care much for it, but I thought it added something extra that was pretty cool. The first time I heard Rebecca Lowman narrated a book I didn’t like her that much, so I was a bit worried my apprehensions with her narration would show again. Thankfully, I was pleased to discover I really enjoyed her narration this time around. I don’t know if she was a more suitable narrator for an adult book or if her pacing just sped up and got better. Bottom line, I liked her narration very much. She did some excellent male voices; the only problem was that I felt all her male characters were the same. Such problem didn’t exist with female characters.